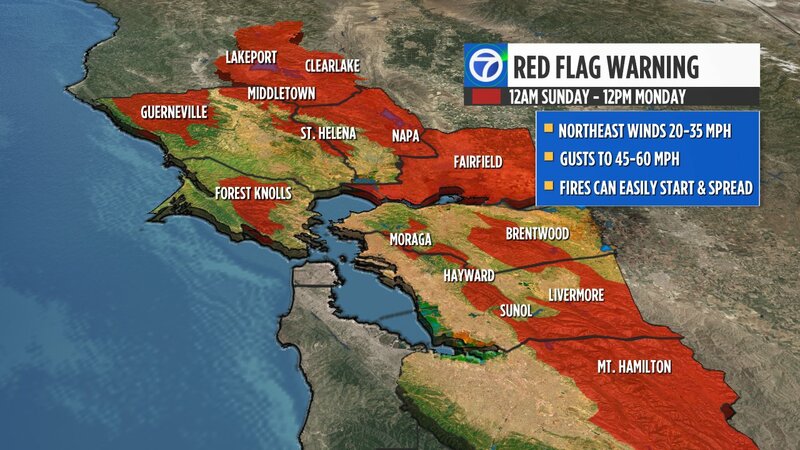 SAN FRANCISCO (KGO) -- A windy end to the weekend means our fire danger will be increasing. Early Sunday morning winds are expected to pick up in the North Bay and East Bay hills. At times, those winds will be racing out of the northeast, gusting between 40 to 60 miles per hour. The wind is expected to last through Monday morning. Drier air will also be ushered into the Bay Area, which will drop humidity levels to dangerously low levels, especially during the daylight hours. A Red Flag Warning will go into effect early Sunday morning at midnight, lasting through Monday at noon. Under these conditions, fires can easily start and spread, and extreme caution is urged, because a simple spark can cause a major wildfire.